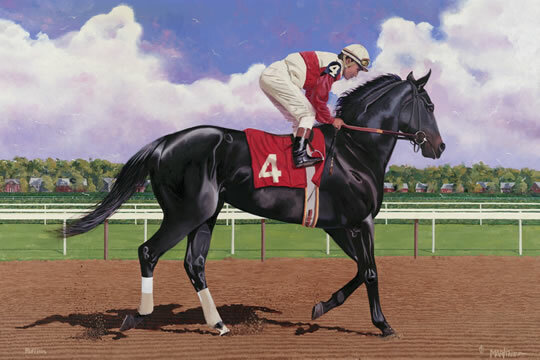 Nick Martinez Art » Products Page » Racehorses » American Champion Thoroughbred: "Ruffian"
Her final race was run July 6, 1975 at Belmont Park, it was a match race between Ruffian and that year’s Kentucky Derby winner, Foolish Pleasure. In the past, both shared the same jockey, Jacinto Vasquez. 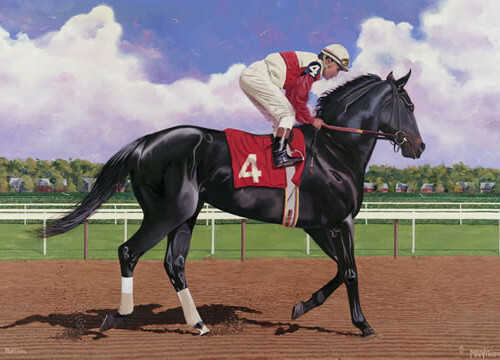 Vasquez chose to ride Ruffian, believing that she was the better horse. Braulio Baeza rode Foolish Pleasure. The great match was heavily anticipated by more than 50,000 spectators and with an estimated 20 million TV viewer. Sadly, Ruffian was injured the later part of the race and had to be humanly euthanized. She will always be remembered as a champion who had heart.